The new 2013 Subaru BRZ keeps getting global recognition and has been honored again with another award. This one comes from Canada as it was most recently named the Autos.ca Best Sports Car of 2013. The rear-drive sports coupe gets all the attention from Autos.ca, and the jointly produced 2013 Scion FR-S doesn’t get mentioned. 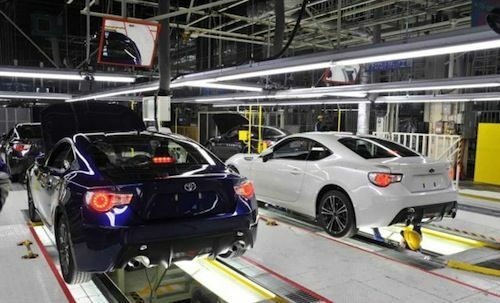 The two cars of course were jointly produced by the collaboration between Subaru and Toyota. Subaru Canada, Inc. reports that after months of deliberation and many hours behind the wheel on the road, Autos.ca has chosen the 2013 Subaru BRZ the top pick for 2013. The two-door sports coupe was chosen by writers and editors at the affiliate of autoTRADER.ca. The list of picks were vehicles from every price point, and chosen based on styling, quality, functionality, fuel-economy, driving pleasure and value for the money. Also among the considerations were class-specific aspects such as cargo capacity, comfort, luxury, handling, payload, towing, utility and ground clearance. So why does the Subaru BRZ get chosen over the Scion FR-S that is virtually the same car? The Subaru BRZ features a slightly different front end, some small tuning differences and option packages. The BRZ is sold around the globe, the FR-S is only sold in North America. Toyota has badged the GT 86 for sale in European and Japanese markets. Maybe it’s chosen because of its unique drivetrain that is engineered by Subaru. Toyota was in charge of its exterior design, but power comes from a Subaru-developed 2.0-liter naturally aspirated flat-four boxer engine that sits low in the chassis. With Subaru handling most of the engineering tasks, the boxer engine sits as far back and as low as possible in the Subaru chassis to allow for an optimal weight distribution and a low center of gravity. This gives the Subaru BRZ/Scion FR-S a dynamically favorable front-to-rear weight ratio of 53:47 and a low center of gravity comparable to some exotic supercars. This is what gives the rear-drive sports car the affordable fun driving pleasure that is helping it win multiple global awards and praise. Who should get more praise, Subaru or Toyota? "The BRZ is an instant classic," said Jonathan Yarkony, senior editor of Autos.ca. "It marks a return to driving pleasure and engagement at the core of its very purpose, and it delivers with stunning precision and capability." Shiro Ohta, president and CEO of Subaru Canada, Inc. said, "It is a privilege to be included. Subaru developed the BRZ with the fundamentals of sports car design in mind and I'm pleased that journalists and consumers alike continue to praise our rear-wheel-drive sports coupe." The two Japanese automakers needed each other to develop the award-winning sports car, but the 2013 Subaru BRZ seems to be getting more recognition for its engineering and engine contribution. Without it, Toyota would have needed to spend millions on developing an engine that would produce similar results, and the car would cost buyers thousands more. Who should get more recognition for the sports car? Tell us what you think, Toyota or Subaru. Really Is this important? Only to the so called, auto journalists, making noise over this. Pick your flavor, and enjoy. The article gives some of the reasons that Subaru is getting the credit but none really to support Toyota. It said that both companies needed each other and that Toyota would have had to invest considerable R&D to come up with a suitable powertrain. It also built a case that the drive train engineering is at the core of the cars superior feel and handilng. No insight, however, was given into what Toyota brought to the table except to say that Toyota was responsible for the exterior. Perhaps in this omision the author has answered his own question. The way I recall it is Subaru went to Toyota to see if they would be interested in building a sports car they had already more or less planned. I read a few interviews from the Subaru guys, including engineers and it sounds they did most of the work with Toyota once in a while asking for this or that. It sounds like it's a 90% Subaru deal to me. But like a previous comment, so what? Both are great cars. These care cars that rekindle the joy of driving. Kudos to both. Now Honda how about that S2000?